Our board certified doctors provide real results! Click here for proof. 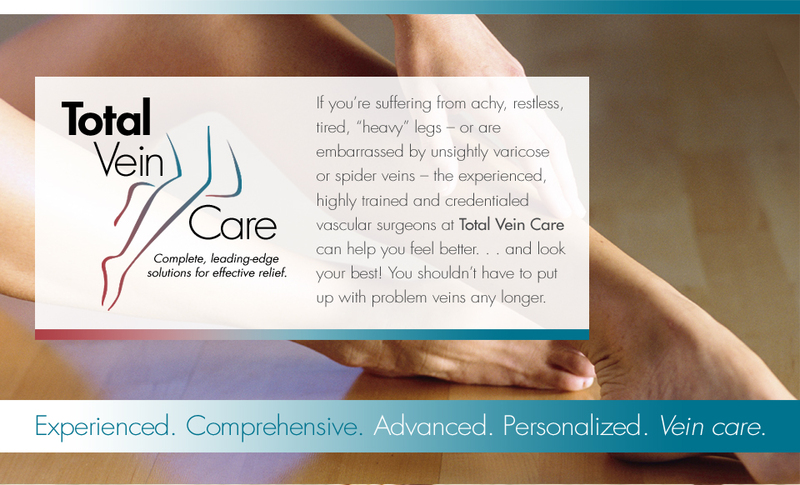 Visit only the best at Total Vein Care. You deal with our doctors from start to finish. Click here to meet our team of experts. diagnosis and treatment of the blood-vessel system. Together, our doctors have more than 30 years of combined experience diagnosing and treating varicose veins, spider veins and other problems related to venous insufficiency, or vein disease. accredited vascular diagnostics lab. We also perform most treatments at our office. Having all of your vein care needs met in one location saves you time and gets you back to a better quality of life sooner. minimally invasive vein treatments to give you the outstanding results you want and deserve with as little pain, discomfort and downtime as possible. Personalized – Everyone has unique issues, needs and goals. We take the time to get to know you and to thoroughly understand your vein problems and desires. Then we can develop a customized treatment plan that will be appropriate to your needs and will provide highly effective results. Vein Care – No matter what is wrong with your veins, we can handle it. We have extensive experience treating all vein-related diseases, including spider veins, varicose veins, venous reflux, chronic venous insufficiency, venous dermatitis and venous ulcers. Our professional, friendly team has helped thousands of patients just like you to look and feel better than they ever thought possible. Let us do the same for you. Don’t wait any longer. Give us a call at (225) 442-9663 or request an appointment online now.